How do I find a dog that will be good with my kids? The better question might be “how do I train a dog to be good with my kids?”. But I’ll address both questions in this post. A family pet can offer love, compassion and unconditional friendship to your kids. But it takes effort to make this truly wonderful relationship flourish. We were adopted by our first pet after we moved into our first house and about a year before I became pregnant with our first child. We found him in the middle of the summer, looking extremely overheated, dehydrated, hungry and thoroughly wiped out from sitting on a curb outside a brand new PetsMart. He was laid out in the lap of a 10 year old boy holding a sign that read “My Uncle bought me this dog but we live in an apartment an dmy mom says I can’t keep him. Please give him a good home.” Having made a deal with my “not so pet loving” husband that once we moved into a house, I would get a dog, I decided that rescuing this poor little pup was as good a choice as any. And so we called him “Chance” since we were definitely taking a chance on this little pup being a good family dog. I tell you that story to endorse the idea of pet adoption verses purchasing a pet through a typical pet store or breeder. There are so many wonderful pets out there that are in need of homes and would have no chance at all without those of us willing to take a gamble on them. In my case, it paid off. We have probably the best “kid-friendly” 70lb dog I’ve ever owned (and I’ve already been the proud owner of 1 pure bred dog, two “pet store” dogs, and two birds). He has commonly been caught patiently sitting with many of my toddlers while they played with his tongue, used his sleeping body as a stepping stool to get onto the couch, stole his toy and even sampled his dog food (see my other article about strange toddler tendendies)! Now I have to ad a caveat to this story. Pets do not come “kid friendly” even though some breeds have a better temperment for it than others. For instance, be aware that most large breed dogs are much more inclined to be patient with your kids than smaller breeds. It may make you nervous to have such a large dog in the company of your small toddler but trust me, larger dogs are much less likely to take a snap at your kids than smaller dogs. A great place to find pets in Arizona in need of rescuing is at Circle L Ranch Animal Rescue and Sanctuary. These are animals that are in desperate need of a second chance and as in the case of my dog, these “second chance” animals make the most devoted and thankful pets. Let your children play a role in feeding your pet. Your dog will learn quickly that these little pack members are a source of their livlihood and will be more likely to assign them respect. On the same note, never let your kids feed your dog from the table…this will encourage your dog to be ever more aggressive at mealtime. Never let your kids walk you pet if they are not strong enough to control them. Once a dog learns that they can easily overpower these “pack” members, they are much more likely to start asserting their dominance. Instead, allow your kids to issue commands to the pet (like sit, lay down, etc.) and reward them with treats. It will help your children understand how to speak with strength to your pets and help your pets understand that they are rewarded for treating these small pack members with respect. Lots of love! Try very hard not to neglect your pets need for love and attention. They are just as much in need of it as your children are. If you are taking on the responsibility of introducing an animal into your family, then this is a crucial component of making that work. You and your children must make time to play, walk, and stroke your pet so they know they are not competing with your kids for love and attention. Allowing your children to interact this way with your pet as often as possible helps both your children and your pet begin to understand this wonderful loving relationship. Early Training. The more you pet, stroke and interact with your dog as a puppy, the easier it will be for them to accept the oftentimes intrusive attentions of your toddlers. Touch their paws, stroke their ears, and most especially pet them while they eat. They are less likely to interpret these attentions as a threat when they are already accustomed to them. 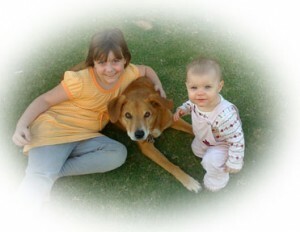 For more info: Check out some wonderful articles on pet safety and care at www.petsweekly.com. You can also build a custom chore chart for your kids to help them remember their pet responsibilities right here on our charts page. Do you have an experience or advice you’d like to share on this topic? Join our forum discussion!